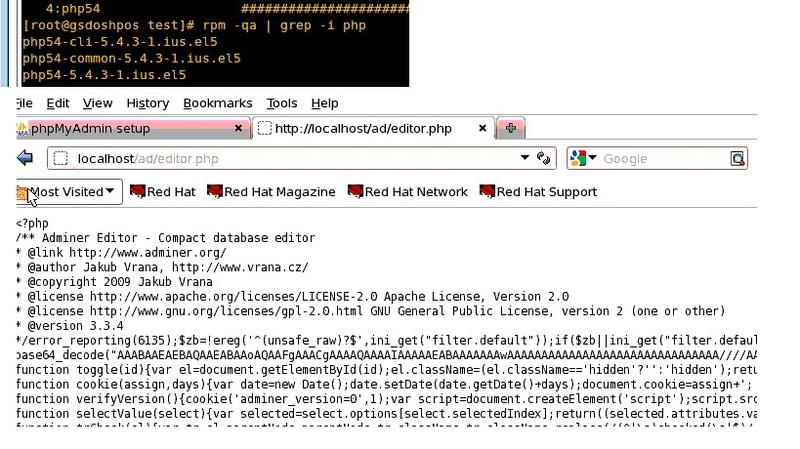 I have setup the adminer and phpmyadmin on Redhat Linux Enterprise 5. Download the editor and edtor.mysql with created 2 subfolders, folder 'ad' for Adminer 'editor' and 'editormysql' and folder 'myphp' for phpmyadmin into www/html folder . When i tried to open the file as http://localhost/ad/editor.php or editormysql.php, it open as script file not the main output. same for phpmyadmin. Please help how to open the file. Do I need to permission 'chmod' to folder and the file? You do not have php installed on your system hence providing you the file in plain text (without interpreting the php code). pls let me know if missed out anything. do i need to change anything on the setup files such as config or etc.